On September 14, at the Okinawa Prefectural Museum & Art Museum, Taichi Hirata, the head of the OPG Department of Culture, Tourism and Sports, held discussions with Francois N. Macerola, of SODEC. On September 14, at the Okinawa Prefectural Museum & Art Museum the International Content Business Symposium, “Globalizing Okinawan cultural content – Learning from Canada-Quebec how to promote local culture” was held to consider how to use Okinawan culture to create businesses. Francois N. Macerola, the president and chief of SODEC (Software Development Expo), and Taichi Hirata, the director general of the Department of Culture, Tourism and Sports in the Okinawa Prefectural Government, discussed the possibility of commercializing Okinawan art and culture, and supporting the relevant structures around that. SODEC is a Quebec governmental organization founded to encourage the film industry to choose Quebec as a location for movie production. Marcerola said, “Okinawa should explore its identity and develop its own cultural business enterprises. Businesses should not only look to expand within the prefecture, but should also focus on opportunities in the main islands of Japan and in foreign markets,” emphasizing the need for cooperation in the public and private sectors, as well as the need for strong leadership. As part of the symposium, Yasuhisa Kazama, from the Okinawa Industrial Promotion Public Corporation, and Yuri Yoshimura-Gagnon, a film producer from Kukuru Vision, introduced case studies from Quebec. 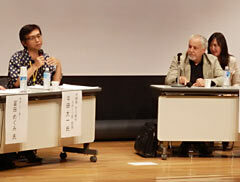 The symposium was a pre-event of the “Bonjour Quebec Cinema Week in Okinawa” held from 15 to 17 September at the Ryukyu Shimpo Hall, in Izumisaki, Naha.